At Royal Comfort North Mechanical and Construction Ltd., bringing comfort to your home is our top priority. 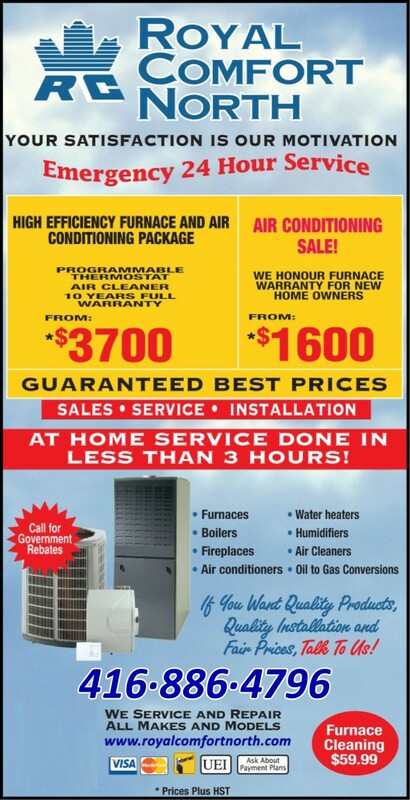 Serving the GTA with over 20 years experience in providing residential & commercial, heating & air conditioning services. At home service completed in less than 3 hours! We provide residential & commercial, heating & air conditioning services to the following areas: Richmond Hill, Scarborough East, Markham, King City, Newmarket, Aurora, Bradford and North York. Methods of Payment Accepted: Visa, Mastercard and Interac.